 Simple Beach Wedding | Wedding Packages from $299. to $1299. Our 3 step system makes planning a breeze! 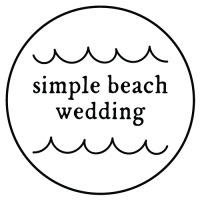 We plan simple beach weddings. That’s it. Nothing else. No distractions. Nothing to steal our focus. No trying to conquer the whole world. We just do our best to conquer our bit of it. So each day we head out, to the beach and deliver the best ceremonies and photography that we can. We only service the most pristine beaches on the Emerald Coast. 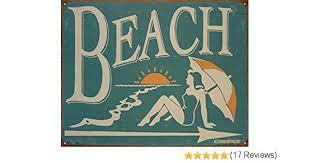 If you looked inside our cars or home you'd find our favorite treasures, pretty gathered seashells and the whitest softest beach sand, you've ever touched. We specialize in making our couples shine because we've taken all of the stress of planning off of their to-do list. We'll tell you where to get your license, share our favorite beach spots and say a few words that will bring the two of you closer than ever before. Those kinds of bonds last forever. Then we'll document this occasion by taking fun photographs of you and your family. There is a great deal of satisfaction to be gained from designing an experience, of such superior quality that you know it is going to stand the test of time. When we look at your friends and family during our ceremony and one person has tears in their eyes, holding the hand of the person next to them who is smiling...it makes the hard work and the obsessing over each and every detail of your wedding worth all the effort. 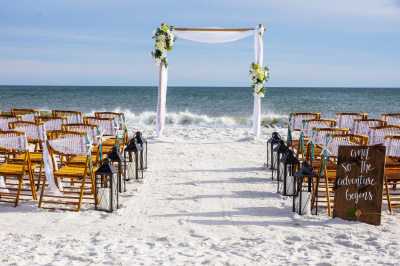 Simple Beach Wedding Package for Just $300. ​​​​​​​​​​​​​​​​​​​​​​​​​​​​​​​​​​​​​​​​​​​​​​​​​​Wondering what our couples think about us? 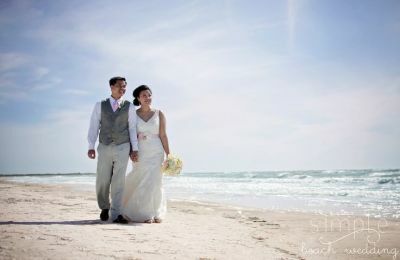 Debra and Marc are great to work with and offered exactly what we wanted in a simple destination beach wedding. 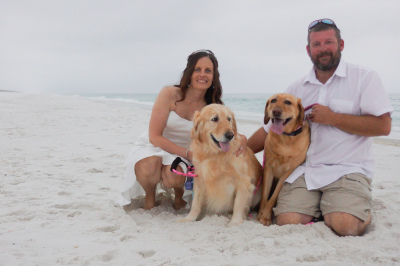 Plus they gladly accommodated our 2 dogs being a part of our special day! What amazing and beautiful pictures! You are a wonderful photographer. Ever picture...I felt like I was right there all over again. I cannot wait to put these in the photo album and send these to family and friends! 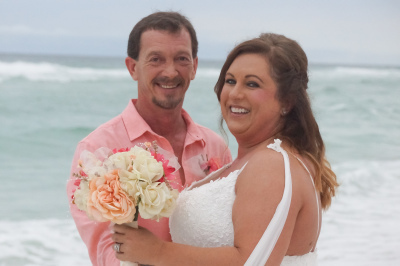 Scott and I want to thank you so much for making our beach wedding so special. Ever detail, every word that was spoken, and the added touch with throwing the seashells in the water...I couldn't have planned anything as special or unique. 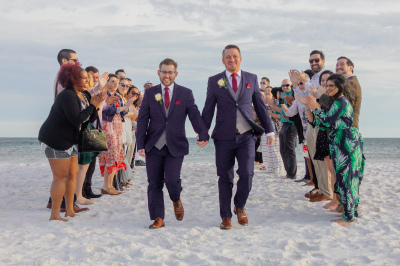 It was the beach wedding of our dreams! Less than 1 week to arrange a beautiful elopment. Kept in touch with me and eased any nerves I had. The pictures turned out beyond beautiful and the ceremony was heartfelt and fun. Originally booked for Navarre beach, then switched to Perdido Key beach at the last minute. This was not a problem at all. Debra was so receptive to my concerns. I am my worst critic when it comes to photos. I am so happy with the photographs that Marc took! ​My husband and I had fun with our intimate wedding! And we had a crane that joined us for good fortune!! 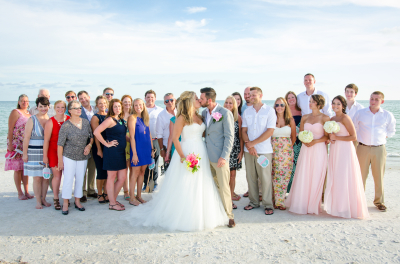 Marc and Debra were absolutely amazing with our simple beach wedding! Very professional and so nice thru the process. 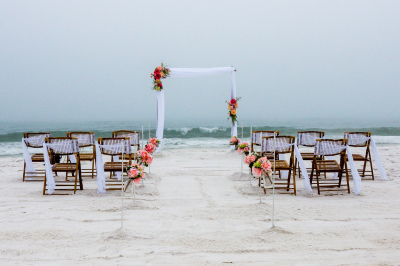 I would recommend them to anyone wanting a simple beach wedding. Marc and Debra were very welcoming. The ceremony was exactly what we wanted. The spot they picked was beautiful and we will remember that day forever. Thank y'all again for everything. I'm definitely going to recommend you to all my friends! ​​​​​​​​​​​​​​​​​​​​​​​​​​​​​​​​​​​​​​​​​​​​​​​​​​​​​​ We love what we do and all the compliments! 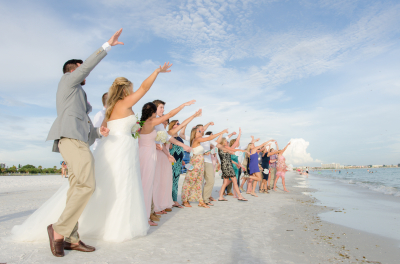 ​​We have planned and delivered well over 1,000 affordable beach weddings in Florida since 2006. 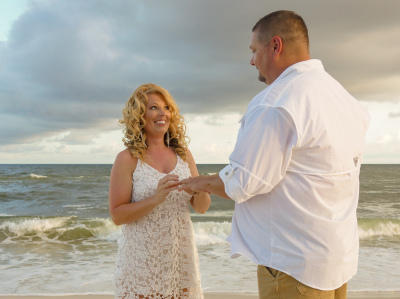 ​​​Simple Beach Weddings in Pensacola, Navarre, Perdido Key and Destin FL Beach Weddings Packages Include Photography & Ceremony from $299. 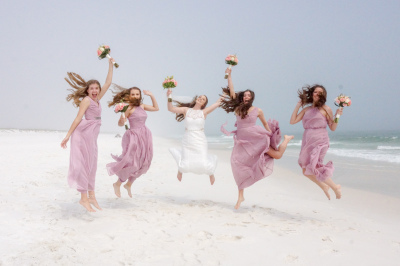 ​​​​​​​​​​​​​​​​​​​​​​​​​​​​​We specialize in affordable yet quality beach weddings in Pensacola, Navarre, Perdido Key and Destin, FL. 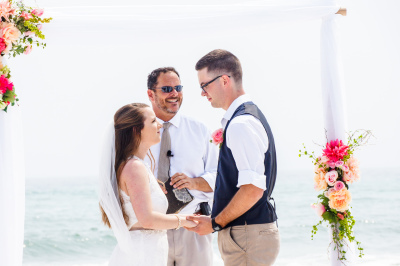 All of our beach wedding packages include the ceremony, minister, officiant, professional photography and the legal filing of your marriage license. Take a look at some frequently asked planning questions and answers below. What is your ceremony like? 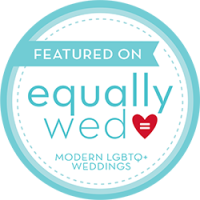 It is heartfelt and meaningful, you have the option of reading special notes to one another and/or inserting a prayer or a even a favorite song all within your ceremony format. After you are pronounced as married, we invite everyone in attendance to join you on the shoreline for a special blessing seashell ceremony. It is a great way of getting all your guests involved and participating in your big day. Everyone from the youngest to the oldest tell us it is their favorite part of the day! We then complete the marriage license and legally file it with the Clerk of Court. What is included with your wedding photography? 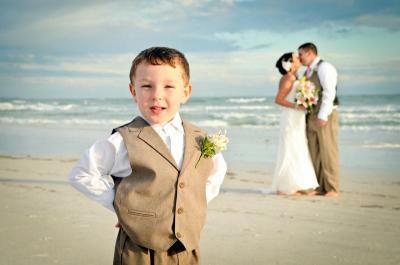 Experienced Photographer with well over a thousand beach wedding photo shoots since 2006. We use excellent equipment and lightly edit pictures before sending them to you via online within days after your beach wedding. We do not count or hold back pictures, you will simply receive all of them with copyright release for you to cherish and share with your friends and family. 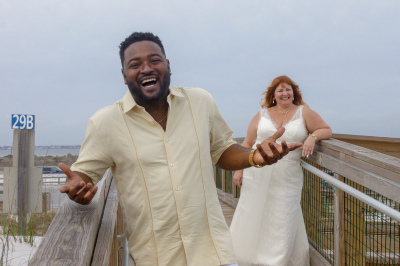 We take pictures throughout your entire ceremony, then some group shots of what you'd like and then fun, romantic and special pictures of the couple on the beach. We are passionate about our photography and never rush, we capture the moments for you and your family. 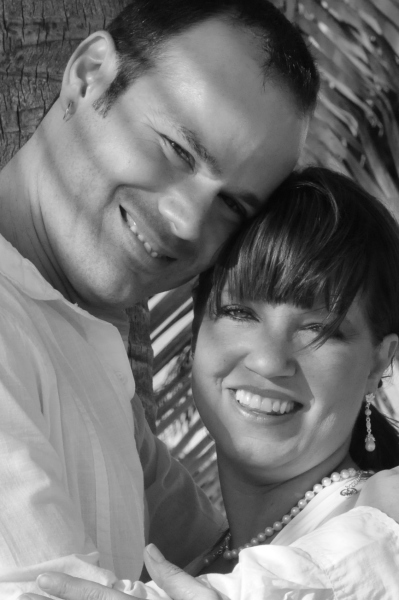 We have been doing special beach wedding events since 2006 and make everything stress free from start to finish! 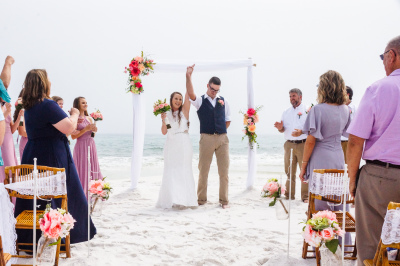 ​For more information about having your simple beach wedding at Perdido Key, Pensacola, Navarre or Destin contact us at 850-285-0290 so we can discus what wedding packages fit your needs!! 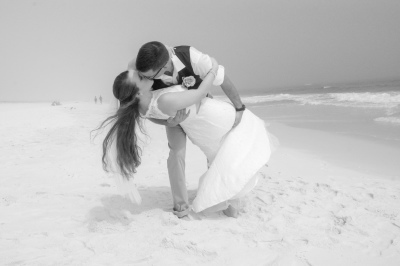 at your beach wedding whether it be on Pensacola Beach, Navarre Beach or Perdido Key!! Newly Designed Wedding Decorations for 2019! Your day will be special no matter what the guest count. 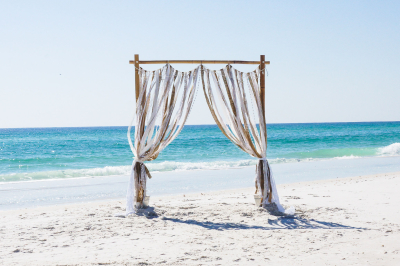 ​​Your emerald coast beach wedding will be a day you will never forget. Preserved forever by the professional photographer who is capturing smiles, laughs, unforgettable expressions of delight, and, of course, the way she looks so beautiful on this the most important day of your life. 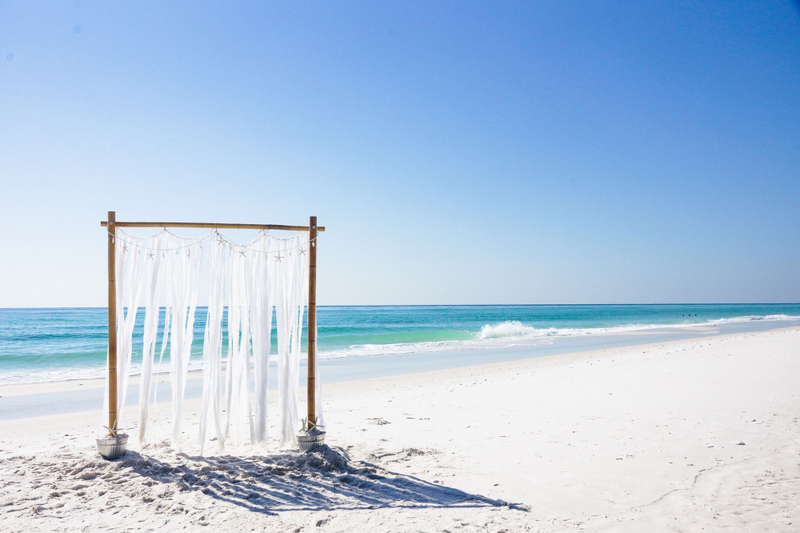 Say "I Do" on the pristine white sand beaches of Florida's Northwest coast. Emerald color waves softly lapping the shore welcome you to your big day. 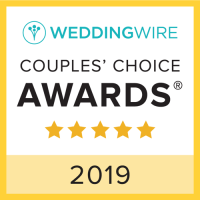 We can offer guidance when it comes to getting your marriage license, what times are most popular for a sunset wedding or simply what each location has to offer when it comes to popularity and fun things to do the rest of your honeymooon. ​Our simple wedding package allows you the flexibility to plan either in advance or at the last minute. What this means for you, is that you remain stress free in the days leading up to your wedding. All that is left to do is enjoy your dream beach wedding!